The emergency phone call came late at night, during his first weekend of his first year as a parish priest in the archdiocese. For the briefest of moments, an already exhausted and overwhelmed Father Matthew Tucci debated whether to pick up the ringing phone. The call was from a family requesting the anointing of the sick for their father. 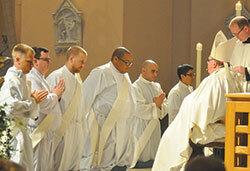 It would be the first time that Father Tucci would administer that sacrament as a priest. Finding the right nursing home on the third try, Father Tucci soon became immersed in a scene in which God’s grace touched the family—a grace that the new priest also experienced. Father Tucci is one of six men who were ordained to the priesthood in the archdiocese on June 25, 2016. As they marked the completion of their first year as priests, they were asked by The Criterion to share their defining moments and impressions from that pivotal year. The stories they tell are touched with humanity, humility and even humor—three qualities that were evident in a defining moment during Father Kyle Rodden’s first year as a priest. “My first week at the parish included many firsts for me,” says Father Rodden, associate pastor of St. Monica Parish in Indianapolis. “For the first time in Spanish, I heard confessions, celebrated Mass, celebrated baptisms, celebrated a wedding Mass and celebrated a quinceañera Mass [a traditional celebration of life and thanksgiving to God on the 15th birthday of a Hispanic young woman]—and that was all within a couple of days. That’s when the moment of humanity, humility and humor occurred. “The Mass was proceeding smoothly until—after the prayer of the faithful, and as the music began for the presentation of the gifts—I realized I had yet to assist the couple with the marriage rite. Whoops! I apologized for my mistake, invited the couple to stand, asked them the appropriate questions, invited them to exchange their vows, and they were married. For Father James Brockmeier, his first year as a priest has been marked by many pastoral moments that have called him “to shape my heart to be more like Christ’s,” including a memorable moment with a child during a funeral. “There was a little boy who was very anxious and sad,” recalls Father Brockmeier, who served his first year as a priest as associate pastor of SS. Francis and Clare of Assisi Parish in Greenwood and chaplain coordinator of Roncalli High School in Indianapolis, and is now associate pastor of St. Bartholomew Parish in Columbus. What happened later stunned the young priest. Father Anthony Hollowell also felt Christ’s consoling presence during a defining moment when he confessed his sins to his friend and classmate, Father Tucci. “The dynamic of sin that I began to feel most strongly after being ordained were sins of omissions, the times when I missed a moment of grace that God wanted to bring into someone’s life,” says Father Hollowell, who continued to pursue graduate studies in Rome during his first year as a priest, and is now associate pastor of Our Lady of the Greenwood Parish in Greenwood. “Those sins of omission are particularly painful, because they are the times when I fail to live out my primary identity, which is to be a father to God’s children. Father Douglas Hunter’s defining experience didn’t come in one specific situation. Instead, it was partly revealed in the 18,000 miles he added to his car’s odometer as he pursued his first-year duties as associate pastor of St. Pius X Parish and chaplain coordinator of Bishop Chatard High School, both in Indianapolis. His travels led him on constant trips to the high school, the grade school, the parish and hospitals where he made numerous visits. He also traveled with St. Pius’ eighth-grade class to Washington, made frequent trips to visit at Providence Cristo Rey High School in Indianapolis, and joined the youth group of the North Deanery for a trip to King’s Island amusement park in Cincinnati, Ohio. Father Nicolas Ajpacaja Tzoc shares two stories that show the range of experiences that have marked his memorable first year as a priest in the archdiocese. “I got a call from the police chaplain at 11 in the morning one Sunday,” says Father Tzoc, who served his first year as a priest as associate pastor of St. Simon the Apostle Parish in Indianapolis. So was the joy-filled moment that came when he baptized a baby. He uses that same description to describe his first year as a priest.